Rocky relations with Russia/Putin. Hardly bridge-building here. And is playing nice-nice helpful…? You gotta be firm yet respectful, not one or the other. Insult Britain. Several times. Again. Piss of Karzai in Afghanistan. At home, things are pretty similar what with Government Motors, buying up commercial real-estate, regulation of more industries, dictation of “how it will be” with several sectors, forcing the American Public to accept health care with the promise that once we try it we’ll love it, and the looming in the wings fight over environmental issues. With respect to health care – usually when I’m going to shell out big money, for a car or a home as examples, I am convinced I’m going to like it before my hard earned money goes away. Guess Democrats don’t seem to think that my opinion matters a great deal. This is not a happiness-building administration. They have bungled every public relations issue they’ve put their hands on – largely because of fake sincerity and false friendship that covers up a truly disdainful approach to everyone that has a view contrary to the Administration. How about mockery of Tea Party’ers? One-sided media coverage? Today on NPR a guest said that we’ll be secondary-screening individuals not just based on names but on “characteristics”, such as “A Nigerian man who has been to Country X recently”. How, pray tell, does this differ from profiling? Speaking of “Unifiers, not Dividers”, shall we look at our Democrat-controlled congress? Giddy on huffed paint fumes they rush headlong into tyranny. By any name, he is a self-proclaimed patriot and is one in reality, too. After laying the groundwork for a decisive vote this week on the Senate’s health-care bill, House Speaker Nancy Pelosi suggested Monday that she might attempt to pass the measure without having members vote on it. Instead, Pelosi (D-Calif.) would rely on a procedural sleight of hand: The House would vote on a more popular package of fixes to the Senate bill; under the House rule for that vote, passage would signify that lawmakers “deem” the health-care bill to be passed. Just like Global Worming, voting and discussion is such a poor way of getting what you want, so you just short circuit all those who don’t agree with you. Spoken like a bunch of effin’ nine year olds. Great, Congress running our country is headed up by a bunch of nine-year olds. Show me a self-professed Uniter, and I’ll show you a man who thinks if he says it enough times he’ll believe it himself. Put differently, a self-proclaimed Uniter is frequently a divider with delusions. Obama has shown zero ability to unite people. Oh sure, he had a beer with high-strung professor and a cop, but you can’t convince me that both men didn’t walk away with the exact same opinion of each other that they came to the meeting with. You also can’t convince me that Obama thinks the cops are any less stupid than he thought when he proclaimed his judgment aloud in the beginning. So now, proof positive that Obama is such a poor uniter that one of our strongest allies is on the outs with us. Between Obama and his in-all-but-name Mentor, Jimmy Carter, Israel has little reason to love the U.S. – at least until a changing of the guard. One can only hope that they don’t reason that the rest of the U.S. feels as our current White House administration does. Obama is so intent on pushing his agendas through that he’s neglecting the very basics of statesmanship and how to behave as the proper figurehead to our nation. The paradox here is that Obama remains hugely popular abroad — from Germany and France to countries where anti-Americanism has recently been a problem, such as Turkey and Indonesia. His following means that, in democratic countries at least, leaders have a strong incentive to befriend him. And yet this president appears, so far, to have no genuine foreign friends. In this he is the opposite of George W. Bush, who was reviled among the foreign masses but who forged close ties with a host of leaders — Aznar of Spain, Uribe of Colombia, Sharon and Olmert of Israel, Koizumi of Japan. Hey, what does Supreme Court Justice Clarence Thomas’ wife’s political leanings have to do with ANYTHING? Suddenly his wife (or him for that matter) is not supposed to have opinions and biases just because he’s a SCJ? Bias is a fact of life. A SJC is understood to have bias, but the unpardonable sin for them is prejudgment. The difference is in one “if I can judge in a particular way I will” vs. “I will judge a particular way in spite of any and all arguments”. She’s got my support. The police had no business reporting her marriage document or sexual orientation to the military. She did indeed play by the rules. Talk about sad. Honestly, people around her should just ignore her until she makes sense. Her 49-year-old partner Philippe — who she met on a dating site for plus-size people — was encouraging her to reach her goal, she said. “I think he’d like it if I was bigger … he’s a real belly man and completely supports me,” she said. Lady, NOTHING is going to be able to completely support you. Unless it has rebar-reinforced foundations and bedrock in the vicinity. There is NOT Always Parity. They were covering the latest not-quite-news-but-still-media-frenzied story regarding Iran’s missile test. The reporter was questioning an Israeli representative. At one point, she tried to demonstrate parity, contrasting Iran’s weapons development (and potentially nukes) and the fact that Israel has had the capability and in fact demonstrated past willingness to bomb and/or attack other countries. Why does the media attempt to be so “fair” and “even handed” that they stop reporting the news as FACT? Fact and the Media New Fairness Doctrine (MNFD – my spelling-out of that acronym is not family friendly) are in no way compatible. There are always two sides, but the idea that one is no better than the other is dead wrong. The Six-Day War should ring a bell. As I recall, there was a preemptive strike on Egypt’s Air Force, then others were involved – Syria and Jordan. Troops were supplied by Iraq, Saudi Arabia, Sudan, Tunisia, Morocco, and Algeria. My point? There’s a lot of animosity there anyway. Has been for a long time. While the topic of Iran’s nuclear pursuits is hotly debated, the fact that Iran has rejected the offer of being given fuel suitable for power generation (but not weapons) must be taken into account. There is the almost-arguable issue of a light-water reactor not allowing them to use home-mined Uranium (reliance on external enriched Uranium sources) but their secrecy in the face of the IAEA does not speak well of their intentions. A heavy-water reactor would use non-enriched Uranium which could then be turned into weapons-grade Plutonium. Some information from pundits regarding Iran’s intent. Michelle Malkin on Iran and the NIE. Whereas, state-sponsored terrorism combined with weapons programs present (1) a clear and present danger, (2) a willingness to do harm both covert and overt, and (3) a vastly improved propaganda program through the use of misinformation and martyrs in militant groups in and around Israel. Those who willingly seek the demise of innocents and civilians solely because of who/what they are are indefensible. 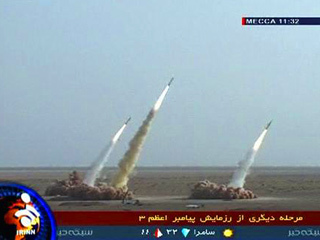 Disclaimer: Iran’s rockets in and of themselves are little or no danger to Israel, as they have great bunkers and lots of advance warning systems. The danger, as I see it, is in providing weapons and/or materials to said proxy groups.